With 22 competitors, 11 competitors each from Qld and NSW, the 2013 Queensland CDE Championships turned out to be a real state of origin competition. Friday afternoon brought some worrying rain and wind and a cool night but the sunshine state turned on beautiful weather for Saturday and Sunday. For the first time at a Qld State Championship, Warwick Club invited interstate Dressage judges Anne Robertson and Warren Ricketts from NSW to oversee the dressage competition. They were accompanied by Anne’s husband Rob who is the State CDE Convenor for NSW. It was a pleasure to have them attend the championships and organisers and competitors alike learnt much from their input and advice throughout the weekend. Thankyou Anne, Warren and Rob. The large pony class was well represented this year with 7 entries. It was great to see more horse entries than last year with 5 in the novice horse class and two in open horse. 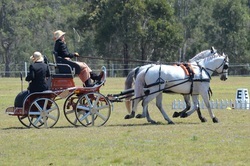 The pony pairs class had two entries with Greg Bowdler back driving this year and Tracie Borg making the trip again from Clermont. Saturday saw competitors presented beautifully for the dressage and cones. Carriages were polished and drivers and grooms all looked very smart. The cones course proved a challenge for some drivers and an incident in the dressage arena in the novice horse class saw driver Jack Murphy and groom David Rozynski requiring an ambulance trip to the Warwick Hospital for medical assessment. Fortunately both Jack and David returned to the grounds a little sore but both OK. Even though Jack’s horse, Iris, was uninjured sadly this was the end of the competition for them. 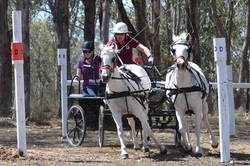 Special mention goes to the Perry sisters Helen and Christine driving Romeo and Antoinette, their pair of Percherons. Christine drove a lovely test receiving cheers and applause from the crowd. Wayne Gadke and Ryan Ward in the novice horse class came in with a tie for second place in the dressage and NSW took out all three places in the novice large pony dressage with Judy Tonkiss, Rachael Bryce and Amanda See taking the honours. 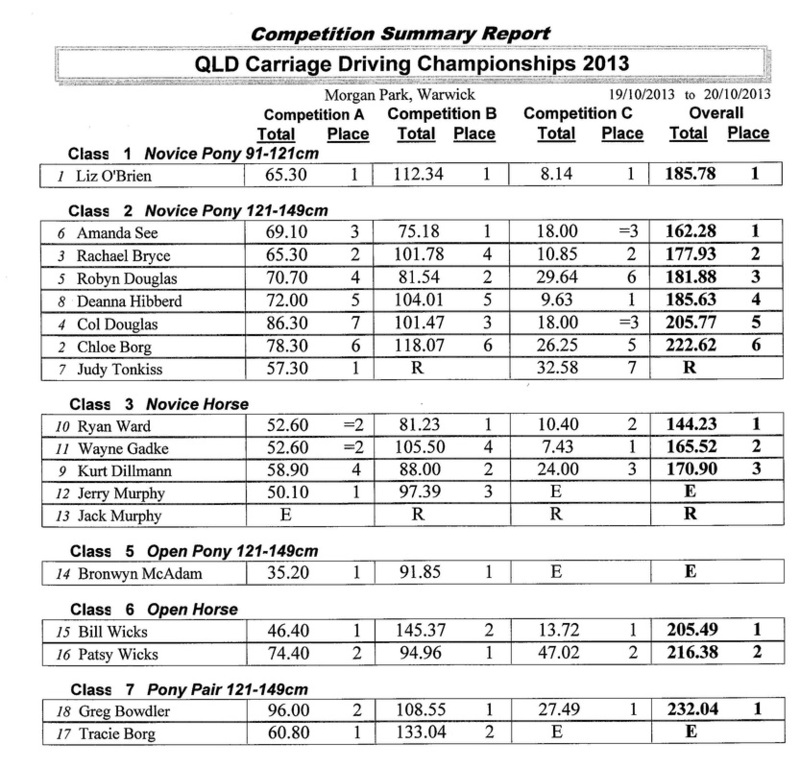 Qld made a comeback in the cones with Deanna Hibberd taking out first place in novice pony. On Saturday evening over 50 people made their way from Morgan Park to the Warwick RSL for an enjoyable evening meal. There was plenty of catching up and storytelling around the tables over a drink or two. The marathon leg of the competition on Sunday was delivered in true Morgan Park cross country style testing drivers for just under 18km. The eight MO’s offered some interesting challenges and drivers had to be on the ball to negotiate some tight and testing MO gates. Greg Bowdler had a busy morning starting the day with his pony pair in the Level One competition and then backing up again with his newest pony, Phoenix, in the Level Four event. Chloe Borg won the Best Performed Junior Award and Ryan Ward took out the Best performed Novice Big Horse. Wayne Gadke received the Renic Harkness and Bob Howard Best Performed Standardbred Award with his gelding Steely Dan. 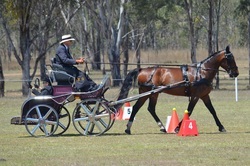 The Neville Lindley Interclub Shield was won this year by Warwick Club and the Qld Combined Driving Championship Best Performed team was won by Tamworth – Amanda See and Rachael Bryce. Chloe Borg, Tracie Borg, Tamar Smith, Karina Cheetham, Claire Dillmann, Kurt Dillmann, Bruce Tucker and Megan Bowdler. Our sincere thanks must again go to all the people who made this event a success – without your help we could not make events such as these happen. On behalf of all the competitors a special thankyou goes to Melanie Dillmann for her tireless dedication behind the camera – without her support we would not have these wonderful photos to enjoy and look back on. Well done Melanie. Dressage photos of competitors available HERE. Cones photos of competitors available HERE. Marathon photos of competitors available HERE.